Taichung’s industrial development started with traditional machinery manufacturing and gradually upgraded to precision machinery. The machine tool industry in Taiwan is known for its world leading positions, making Taiwan the fourth largest country by machine tool exports. 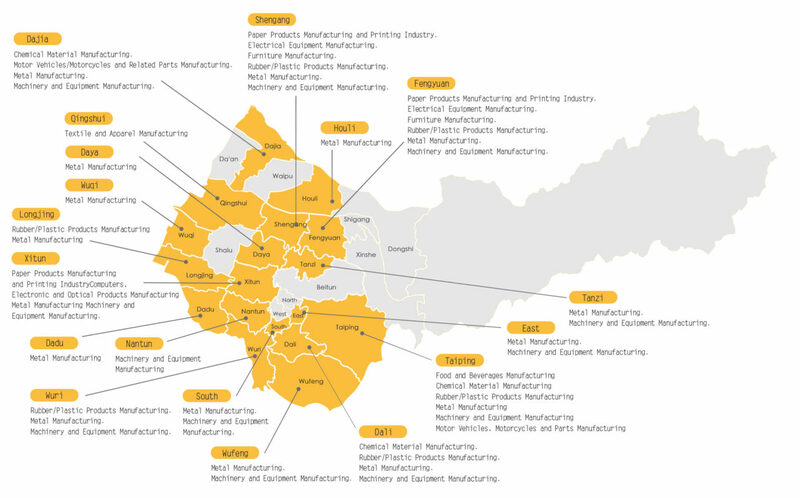 Seventy percent of the precision machinery, machine tools and parts manufacturers in Taiwan have their manufacturing facilities in Taichung. The clusters increased productivity. Besides, there are shared synergy between precision machinery and aerospace industry. The Taichung City government follows the Central Government policies and works towards the goal of making Taichung the capital for smart machinery industry. The City Government aims at building a headquarter for smart machineries, defense and aerospace in the central Taiwan by not only connecting aerospace and smart machinery industries but also integrating parts manufacturing and repair industries to achieve the future goal of “domestic manufacture of warplanes and warships”. The domestic orders could fuel industry transformation and upgrades. Besides, the domestic purchase orders placed by premium businesses in the industries could lead to the development of the manufacturing and parts related industries. Industrial parks such as Central Taiwan Science Park in Houli, Central Taiwan Science Park in Taichung, Taichung Industrial Park, Taichung City Precision Machinery Innovation Technology Park, Shengang Fengzou Science Park and Taichung Export Processing Zone, link the industry value chain and form a trans-Taichung industrial corridor. Taichung takes advantage of the “dual-port” advantage of Taichung Port and Taichung International Airport and becomes the gateway for Taiwan’s innovative industries to access Asia-Pacific region. This also helps bring Taiwan’s smart machinery industry to an international level.